A hamam (can be spelled hammam) is also known as a Turkish bath, or a steam bath. The hamam is the place where people in Middle Eastern communities bathed for centuries. They reached their height of popularity in Istanbul in the 15th century, and are still frequented today. Hamams are famous for their grand architecture, marble steam rooms, and bath attendants that will scour, soap and massage you clean. More recently, there has been a growing interest in hamams in the west. There are hamams in such cities as Paris, London, New York, and Vancouver. My mom and I went to Miraj Hammam Spa in Vancouver when she came to visit. We were looking and for a different kind of spa; and found that Miraj Hammam offered an authentic hamam experience, and an enchanted trip to the Middle East. We arrived, checked in, and were assigned lockers in the small well-appointed change room. After a shower we wrapped ourselves in the provided sarongs and were guided to a candlelit, marble steam room, with a vaulted ceiling. Here we were able to relax on warm marble slabs and absorb the gentle steam as little dancing flames illuminated it. Before long, our estheticians came to give us a gommage, meaning a soft body scrub using black Moroccan exfoliating soap. Then, we rinsed, robed and went to private rooms for a massage. Detoxified, buffed, and kneaded; we were as light as the steam that had cleaned our pours and feeling just as evanescent. We moved to the Sultana Lounge where we had tea and sweet buns while reclining on palatial day beds and drifting into a catnap. Eventually we roused ourselves and wandered back to reality. Miraj Hammam Spa described itself as; “An exotic oasis where you can indulge yourself in traditional Middle Eastern treatments while your imagination takes you on a mystical journey into the past.” What the website doesn’t say is that every need you have has been anticipated, all efforts are made to ensure peace and privacy, and you come away rejuvenated and with a great story. 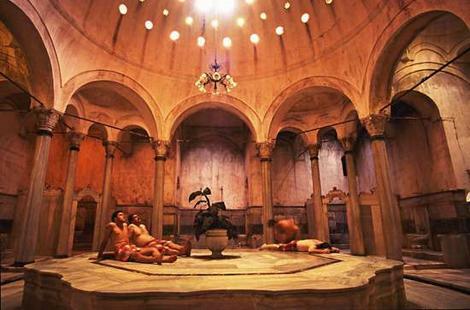 I am looking forward to going to Istanbul someday to visit a historical hamam. 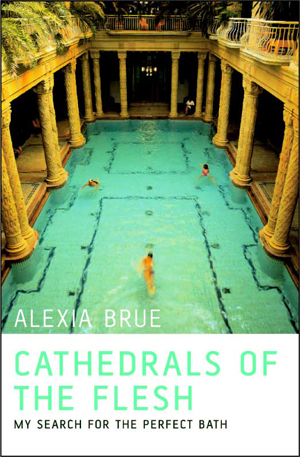 However, Reading Cathedrals of the Flesh, Lonely Planet excerpts, and various other travel writing, I understand that in many countries the bath attendants are not licensed massage therapy professionals. There also seem to be various types of hamans that have different operating principles regarding mixing gender, services provided, and tolerance towards tourists. So, it is a good idea to do some research, make some local friends, and ask questions before you go.